Universities: Columbia, Yale, Harvard, etc. 1) It appears that a major activity for the early colonies could be the construction of satellite solar power stations, for location in geosynchronous orbit to supply the Earth with electric power. Estimates of the economics indicate that this approach may be practical even with present-day figures for lift costs and powerplant mass/power ratios, and may be an order of magnitude cheaper than for Earth launch. An article is finished and has been submitted for publication. 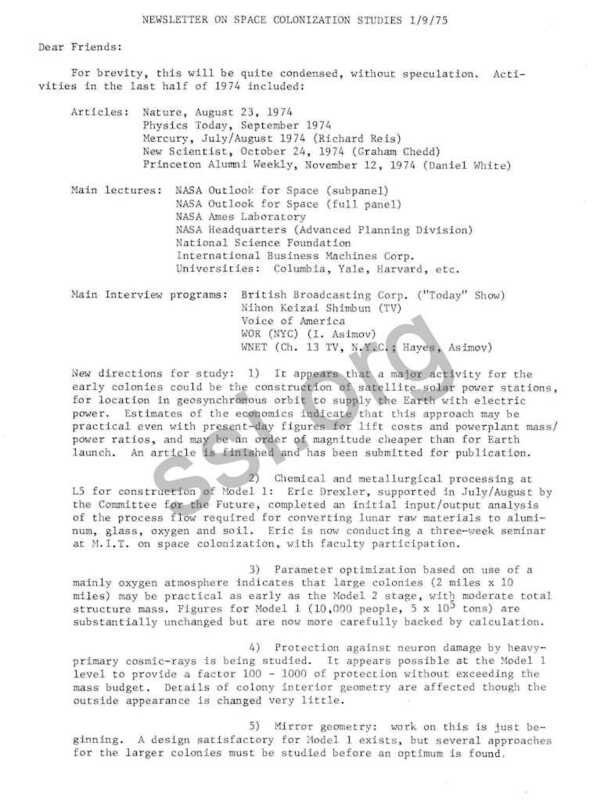 2) Chemical and metallurgical processing at L5 for construction of Model 1: Eric Drexler, supported in July/August by the Committee for the Future, completed an initial input/output analysis of the process flow required for converting lunar raw materials to aluminum, glass, oxygen and soil. Eric is now conducting a three-week seminar at M.I.T. on space colonization, with faculty participation. 3) Parameter optimization based on use of a mainly oxygen atmosphere indicates that large colonies (2 miles x 10 miles) may be practical as early as the Model 2 stage, with moderate total structure mass. Figures for Model 1 (10,000 people, 5 x 105 tons) are substantially unchanged but are now more carefully backed by calculation. 4) Protection against neuron damage by heavy­primary cosmic-rays is being studied. It appears possible at the Model 1 level to provide a factor 100 -1000 of protection without exceeding the mass budget. Details of colony interior geometry are affected though the outside appearance is changed very little. 5) Mirror geometry: work on this is just beginning. A design satisfactory for Model 1 exists, but several approaches for the larger colonies must be studied before an optimum is found. 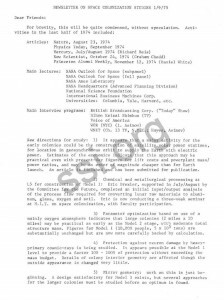 Support: For the six months starting January 1, 1975, a grant of approximately $25,000 has been received by Princeton from NASA, for the study of space colonization. The cost of this grant was, I understand, shared by NASA Headquarters (Manned Spaceflight Office) and the NASA Ames Laboratory. It will go mainly to the salary of a full-time Research Associate (Dr. Eric Hannah) and for half-time editorial work on the 1974 and 1975 Conference Proceedings (Ruth Miles). Mrs. Miles had previously been working part-time on a volunteer basis. Support beyond June 30, 1975 has yet to be discussed. Among those scheduled for the next five months are the Aerospace Corporation (January 30), the Jet Propulsion Laboratory (Cal. Tech.) on January 31, AIAA, Huntsville, Alabama (February 12), Sigma Xi, Richmond, Virginia (February 13), Applied Physics Lab., Johns Hopkins (February 21), Michigan State Univ. (February 27), University of Indiana (February 28), AIAA Princeton (March 6), University of Pennsylvania (March 12), Ithaca College (April 9), NASA Goddard Spaceflight Center (probable date March 7), and General Electric Corporation (April 24). been scheduled for May 7, 8 and 9. In keeping with the University Conference series format, attendance at the first two days will require a fee covering meals, lodging and conference expenses. There will be approximately 20 invited papers in the first two days. Television will not be permitted during those working sessions, and repertorial interviewing will also be discouraged on May 7 and 8. May 9 will be a half-day, devoted to about four summary talks. That session will be open to all, without fee, within the capacity of the modest lecture hall (Yamasaki building, Princeton). The American Institute of Aeronautics and Astronautics will share in sponsorship of this Conference. There are several team or class studies in progress on the architecture of Model 1. For technical information on size, geometry, cosmic-ray shielding constraints, etc., Dr. Eric Hannah should be contacted, 609-452-4399. Dr. Ludwig Glaeser, Curator of the Mies Van der Rohe Archive of the Museum of Modern Art, New York is coordinating a longer-term architectural study. Anyone planning to show a design study or model at the May 7 -9 Conference should contact Dr. Hannah as soon as possible; we plan to turn over the coordination of any such displays to an architectural specialist. From February through April I will be teaching a double course load, so will often have to refer questions and correspondence to Dr. Hannah during that period. For U.S. citizens who are faculty or research members, preferably with two years of teaching experience. OBJECTIVES: (1) To increase competence and to develop concepts which will enable participants to organize multidisciplinary engineering systems design programs and courses at their home institutions. (2) To establish and to further communication and collaboration between engineering and other disciplines. (3) To create a definitive engineering systems design. DESIGN FELLOWSHIPS: Awarded to engineering, natural and social science faculty members in programs of summer study to be undertaken by several universities in cooperation with NASA research centers. Fellows will come to universities adjacent to NASA centers to participate as members of multidisciplinary design teams. Each group will select and design a complex engineering system. such as an unmanned planetary reconnaissance vehicle, an environmental monitoring and control system or an information management system. The fellows will be associated directly with the NASA program and will be confronted with the most modern systems design problems. The engineering systems concept, that of approaching the design problem in its entirety, will be utilized by the faculty design teams. FELLOWSHIPS: Stipends are $300 per week. Travel allowance will be paid. Approximately 80 Fellowships will be awarded. The design of a system for the colonization of space. Stanford Summer Study on Space Colonization. I would like to express deep appreciation to the hundreds of people who have written to offer their encouragement and support, and even greater thanks to those now actively doing volunteer work. I am sorry that the backlog of mail has often delayed answers for many weeks; Dr. Hannah’s efforts are already of great help to me on that score. Volunteer participants with typing skills, living not far from Princeton, would be of great help to us in the next months.